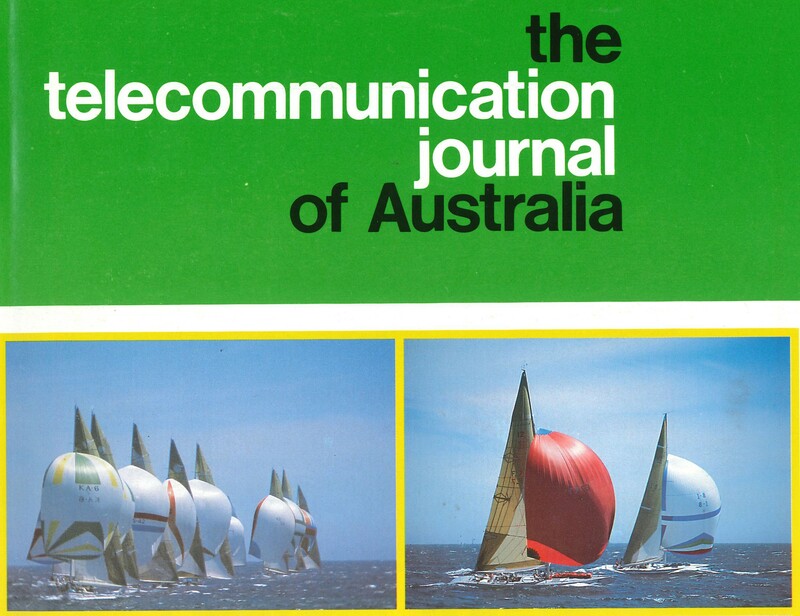 In 1986, the Society produced a special issue of the Telecommunication Journal of Australia (Volume 36, Number 2) featuring ten papers on the communication needs for the America’s Cup challenge scheduled for 1986/87. Two of these papers have been selected for this historic review. 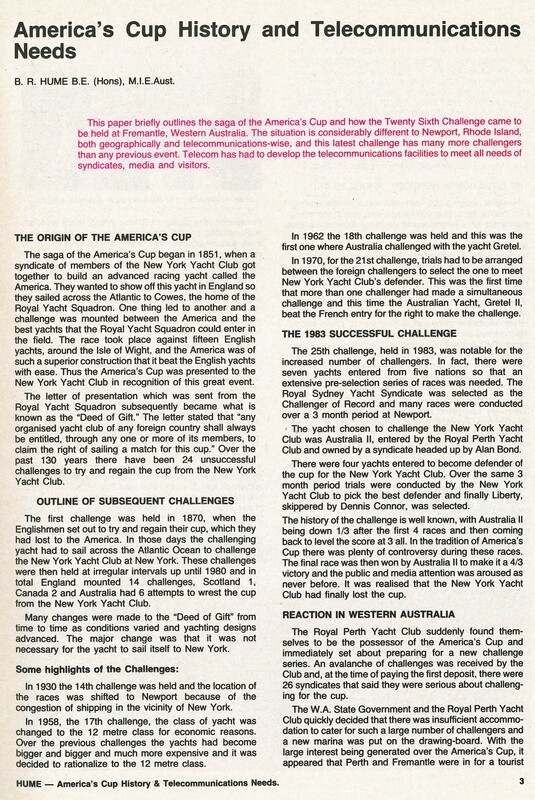 In 1983, Australia II from the Royal Perth Yacht Club in Fremantle, Western Australia, was successful in winning the America’s Cup from the New York Yacht Club, ending over 130 years of possession and 24 previously unsuccessful challenges. 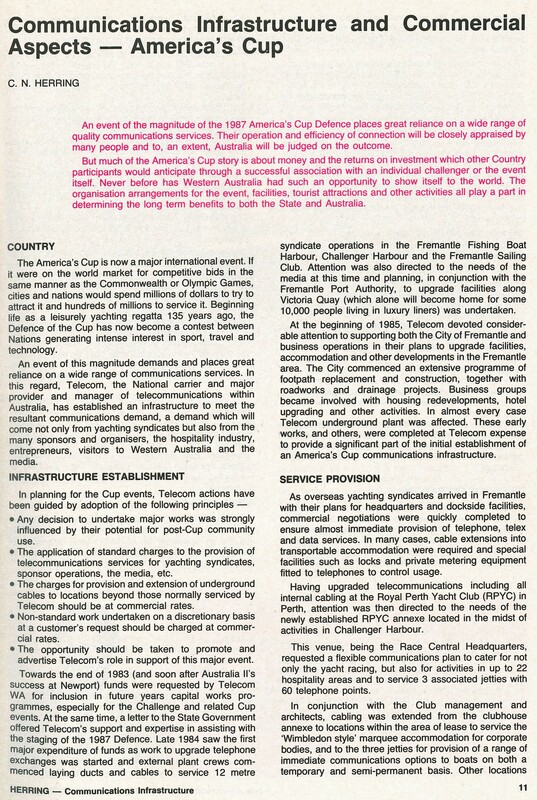 The race history is well known, with Australia II coming from 1/3 down to win 4/3, and the world yachting spotlight focussed on Fremantle for the Cup’s defence in 1986/87. 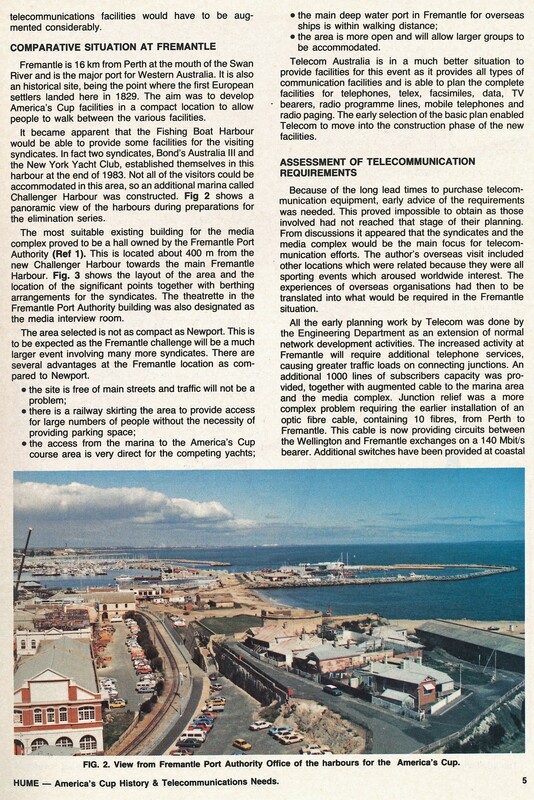 The first paper (Hume, 1986) provides a summary of the America’s Cup history and an overview of the infrastructure and telecommunication requirements in Western Australia. 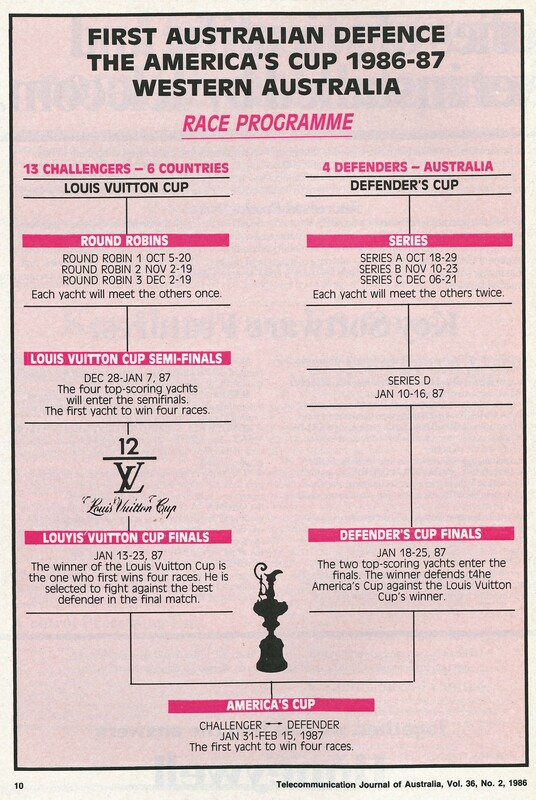 Logistically, seven syndicates challenged for the cup in the US in 1983. Initially, twenty-six syndicates indicated they were serious about challenging in 1986/87, which later was reduced to thirteen by the time of the elimination races. 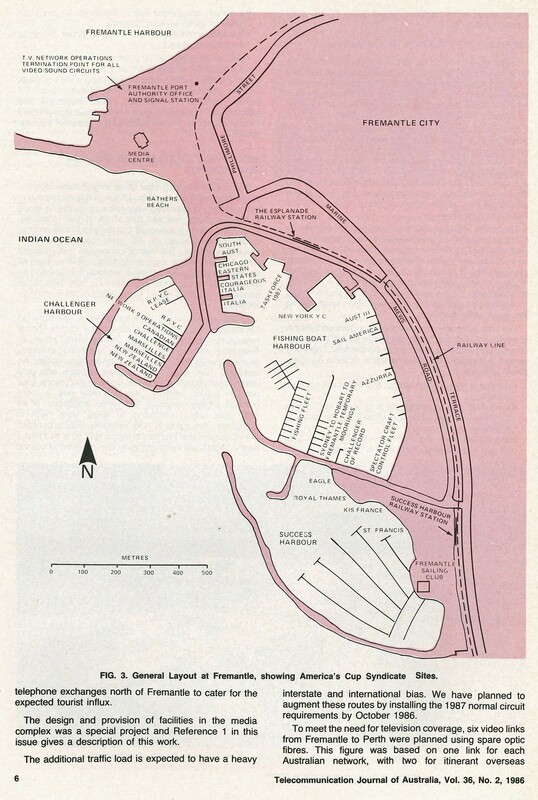 The paper details the necessary upgrades to dock facilities at Fremantle, and provides an explanation of the “12 metre” boat dimension rule and the race program for this first Australian defence. 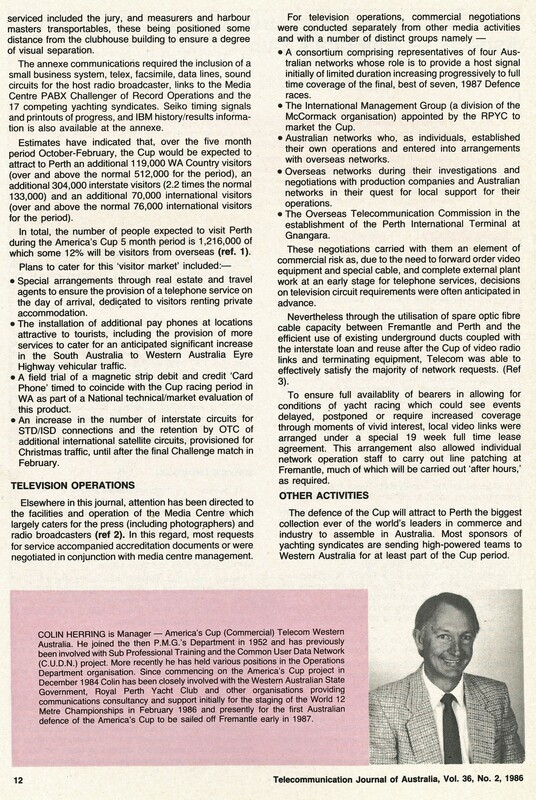 The second paper (Herring, 1986) discusses the infrastructure establishment, service provision, television operations and navigational equipment. The number of additional visitors to Perth was estimated at well over one million people, of which twelve percent would be overseas visitors. 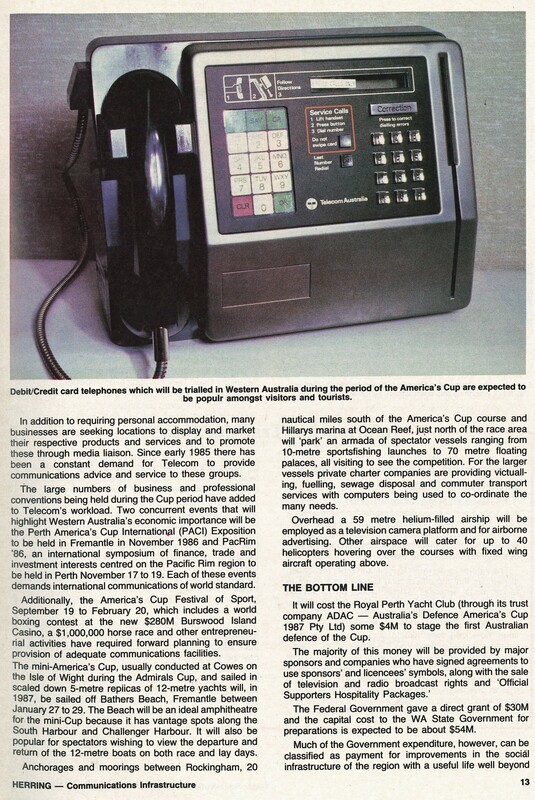 This influx forced major capital works to be undertaken and helped the introduction of new technology, such as debit-card public phones. All spare telecommunications capacity in the surrounding area was also brought on-line for the event. The Official America’s Cup Directory. 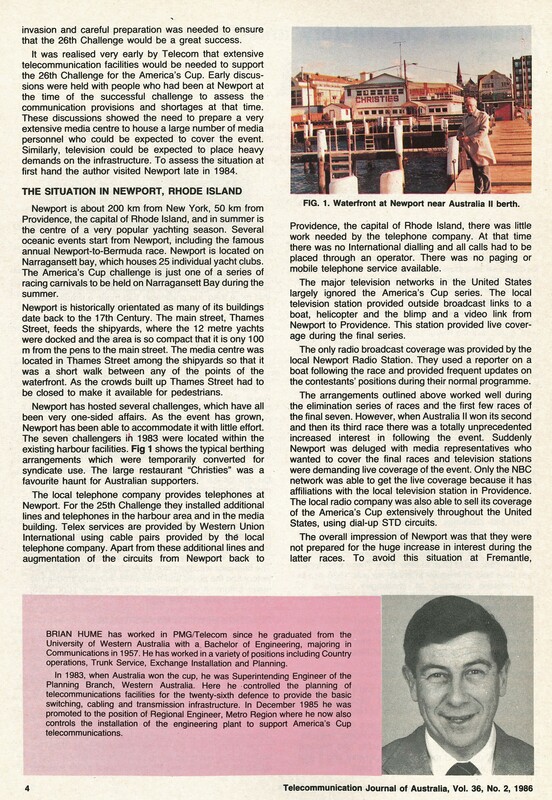 Dennis Conner skippered the Stars and Stripes 87 yacht to a 4/0 victory over Kookaburra III at Fremantle in early 1987. 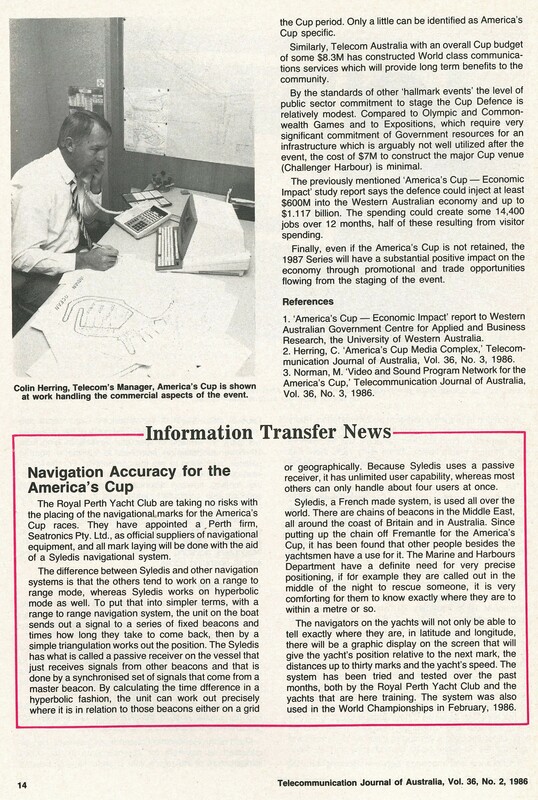 The Cup subsequently returned to San Diego Yacht Club in America. 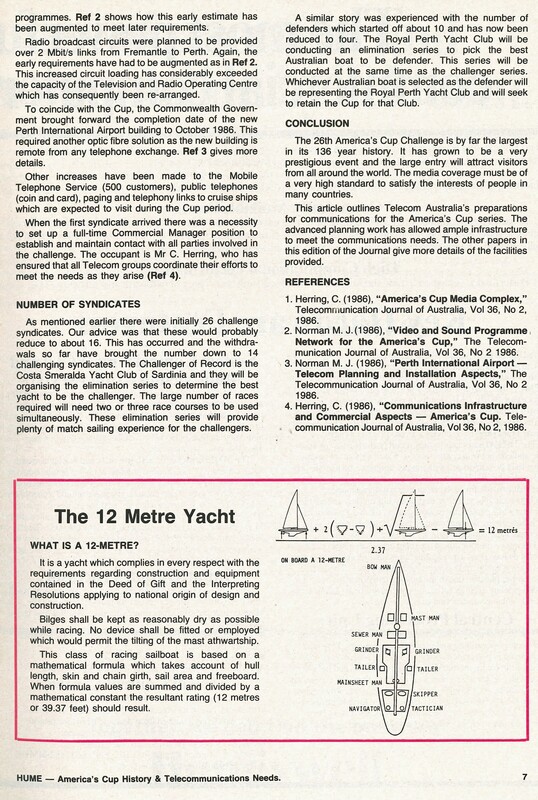 This was the last time twelve metre yachts were raced for the America’s Cup, as the rules were changed to allow for different boat designs such as multi-hull catamarans.